Hong Kong’s high court recently withdrew a charge and awarded damages to several pro-democracy protesters, including prominent student leader Joshua Wong. On Saturday, a high court judge ruled that there wasn’t enough evidence to prosecute Wong, the teenage face of the pro-democracy Umbrella Movement, as well as thirteen others for “obstructing bailiffs and police” who were authorized to clear a main protest site in the commercial neighborhood of Mong Kok. According to Apple Daily, the court awarded HKD$56,000 ($7,222) in damages to the protesters. Wong, who was represented by a private lawyer, got HKD$22,500 ($2,902). 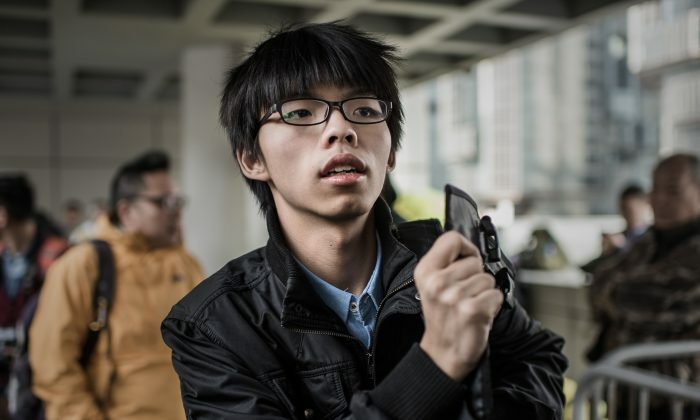 After the court session, Wong, 18, told reporters that the Hong Kong authorities are trying to tie down pro-democracy protesters in legal proceedings, and in the process, weaken the court’s authority and influence. Wong and other pro-democracy activists said something similar in a preliminary hearing for the case on Thursday. Shum and some other protesters have not been summoned to court for a final ruling yet. During the police clearing of Mong Kok on Nov. 25, Wong and Shum had stood at the front of protester-built, makeshift barricades, and demanded that bailiffs properly explain the court injunctions that a private mini-bus company applied to have the protesters evicted from the streets. A video of the incident shows police rushing in to nab Wong even though he did not act aggressively or show signs of “obstructing” the police. The authorities may have been unable to press charges against the pro-democracy activists for the protest site clearance, but they have already started the first phase of mass prosecution. Police called 32 key protest figures like Wong and Shum last week to schedule dates for them to surrender at police headquarters for the charge of “inciting an illegal assembly.” About 1,500 protesters could eventually be charged.